In the festive holiday season of overeating, I like to make sure wildlife is included. 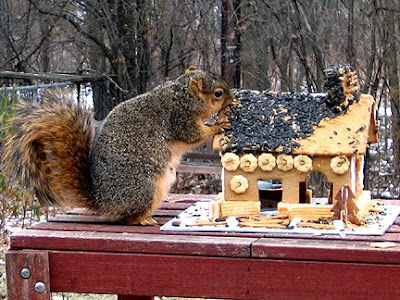 Here's a gingerbread house I made especially for birds and squirrels. Everything's edible for my wild friends (no chocolate, no hard candies, etc.) The house is made of real gingerbread and the sides are held together by icing made from confectioners sugar. A friend makes the houses and hosts a party where each person decorates the house to her fancy. In my case, I used peanut butter to hold all the items (sunflower seeds and other sweet treats) in place. You're welcome, squirrly! How cute. Not wanting to hurt his feelings, but he could miss a couple meals;) He looks a little pudgy. Good idea! We always put ours outside after the holidays, much to the teenager's chagrin. He get very upset as he wants to eat it. One year a stray dog ate the whole thing-do you think it got a stomachache? :) Your is much better having the right stuff on it. What a clever, clever idea! This is a project that kids could really get into. Would you post more of how you made it? The squirrel looks like he's in heaven! As a fellow udgy lifeform, I can assure you that we HATE to miss meals, LOL! I made mine the traditional way the first two times I made one, but this idea dawned on me last year, and I like it. I long time ago, in the 1990s, I actually baked a gingerbread house myself. I'm not sure where I got the recipe for gingerbread houses, but I'm sure one can find it online these days. It's a dough you roll out. My mine had made cardboard templates, which I used to cut the pieces. Each side is glued together using confectioner's icing that dries hard. I used canned fruit as supports and attached two sides at a time. In the last few years, a friend hosts a gingerbread house decorating party where she makes the houses and people decorate them. She said she bought gingerbread house cookie cutters this year, which she found a lot easier than using a knife to cut around a cardboard template. I can ask her for the recipe and where she got the cutters, as I'll be seeing her later today. Editor's note: Um, in my first comment, "udgy" should have been pudgy, and in the third, "my mine" should have been my mom! Hi Monica, you are so funny, feeding those rotten squirrels, ours do not deserve this kind of special treatment, but I have to admit the photo of Mister S. pigging out is too cute for words. Our squirrels are pudgy right now, too. I think it's because they're still enjoying the bumper crop of acorns that grew this year! :-) Very cute idea, GFM! Do the birds get a chance at it? Wow, I'm very impressed! I wish I could do something as special as that for my feathered friends.... lucky them! by the way, The House in the Roses is having a party!... Come to the “World of Treasures” and show your lovely treasures... Come see! Wow this is so beautiful! You have a great site! Real gingerbread houses (as opposed to animal-friendly ones) . . . we have a shop near here that sells kits. The gingerbread is already cooked into the right shapes and packed into a box. You only have to stick it together with icing. Bless your heart..I love this..is it actually gingerbread? ?..I always make up thick crunchy peanut butter sandwiches on whole grain natural bread and throw out to my winter visitors..everyone shares..birds, sqirrels,blujays. possums..yes you heard me right!Love this idea! Let me know what the base is please! That little house is adorable. It looks like your little friend is having the time of his life. LOL, I confess I love squirrels. They're the closest thing to a totem animal I have. It's odd I hate groundhogs, but I love squirrels and chipmunks. As long as there's snow, I don't mind winter. In the last two years, birds were all over it, especially jays and sparrows. This year it seemed invisible to anyone but squirrels. Oh, and one solitary crow. Which does count as a bird! It really doesn't take long to decorate the house at all. It's really no big deal making these. What makes me a better friend to wildlife is that I donate money (yes, even cheap frugal people donate money!) to two local groups: Bird Center of Washtenaw County (which rehabilitates injured and orphaned birds, and where I volunteered for a time) and Friends of Wildlife that rehabilitates injured and orphaned bats, coyotes, deer, fox, groundhogs, opossums, rabbits, raccoons, raptors, songbirds, squirrels, turtles, and waterfowl. The gingerbread and icing can be eaten by people and wildlife alike with no alterations to the recipe; it's just the toppings that need to be specifically not chocolate or spicy or gummy or minty, etc. Yes, it's normal gingerbread (see reply to Lucy above). The base is a piece of pressboard, covered in aluminum foil secured with painter's tape on the bottom. The house is attached to that with the icing. My friend made the houses and bases. In the past, I've removed the base before setting it outside, because I was worried the birds or squirrels might accidentally eat little bits of aluminum foil, but this year it went out as is and was fine. I had also made a walkway out of pretzel sticks and stepping stones out of cookies, both "cemented" in place with peanut butter, and the squirrels really liked pulling those off. Squirrels sure love PB! I also make them PB sandwiches, but I use cheap bread from a discount bread store that sells old bread really cheap, specifically to feed wildlife (it's maybe 75 cents for however many loaves you can stuff in a plastic bag). I do cut my pieces to size because I live near a natural area and get so much wildlife it's easier to have smaller treats for each than to have them fight over a big piece. I use crunchy PB for that, but smooth for the house. It's fun to have traditions with kids, but there's always next year! I used to get my niece and nephew German Advent calenders filled with chocolate each year, and I mailed one to my niece this year even though she's 23 now! Heck, I have my own! I think my little friend is a girl, but she does seem to be having fun! Thank you Monika for the tips..guess what my wildlife are getting for Christmas!! Funny how we both make peanut butter sandwiches for our little visitors! Awesome! 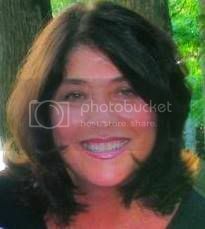 You are the Martha Stewart of the Natural World! It is the season of overeating and you are spreading the fat erm joy around I see. ;-) It's obvious that this pudgy squirrel really appreciates the cute little house you've decorated for it. BTW do squirrels eat gingerbread? Yes, the squirrels eat the gingerbread. They prefer the seeds and peanut butter but do at the gingerbread last. The house is long gone, now. What a nice idea to bake this little "house" for your friends outside! They will be grateful and come back to your garden in summer, I guess! Thank you for visiting and the comment you left, so I found the way to your blog! I love it! Our squirrels tend to just get old cooked chicken from us (an Oak Park squirrel researcher found out that their favorite food is fried chicken), but I'm sure that they'd like a gingerbread house for dessert.